Unless you have been living under a rock for the past couple of years, you will know all about the ‘Go for 2 & 5’ campaign. 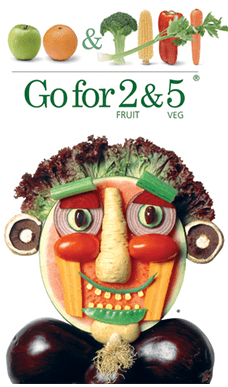 The Australian Government created a funny, friendly looking fruit and veg man who informed Australian kids (and adults) about the importance of consuming 2 fruits and 5 vegetables each day. The government pushed this campaign hard, with flyers, television advertisements and even educational programs in school. The campaign was an effort to promote healthful behaviours in our increasingly unhealthy population. However, is ‘2 & 5’ enough? While it’s a good place to start, good health isn’t so simple. Nutrition Australia, has pushed for a movement away from ‘2 & 5’ and toward ‘Eat the Rainbow’. Sounds like a Skittle advertisement, doesn’t it? Nutrition Australia’s ‘Eat A Rainbow’ campaign, however, does not refer to taste testing colours of sugary lollies. It refers to the importance of consuming not only, healthy amounts of fruit and veg (hello ‘2 & 5’), but stresses the need to eat a wide variety of colourful fruits and vegetables. 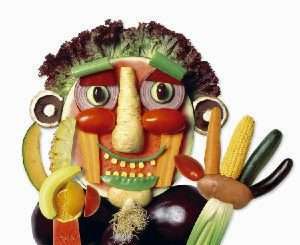 Eating a wide range of fruit and vegetables ensures adequate vitamin and mineral consumption. Aside from this, fruits and vegetables of different colours contain a myriad of phytochemical compounds with a plethora of health benefits. Let’s start with fire-engine red. Some red/pink fruits such as tomato, watermelon, papaya and grapefruit contain the carotenoid lycopene. Lycopene has anti-oxidant functions and is thought the be an active component in fighting against some cancers, particularly prostate. Prostate cancer is one of the leading causes of death in Australian males over the age of 50. Perhaps by increasing lycopene consumption, these statistics can become a little less alarming. Once ingested, lycopene is metabolised to apo-lycopenal derivatives. These apo-lycopenals are capable of interfering with cancer cell proliferation. Exact mechanisms are, as yet, unknown and epidemiological studies are currently inconclusive. However, there is enough evidence to suggest some relationship, so, including some red on your plate is probably wise. Other carotenoids such as carotenes and cryptoxanthins, as well as being anti-oxidants, are vitamin A precursors. They are responsible for yellow and orange hues of carrots, mango and yellow plums. Once consumed, carotenoids are cleaved by enzyme BCO1. This produces one or two active vitamin A molecules, dependant on the carotenoid cleaved. The active vitamin A molecule binds with a protein called opsin. Together, this complex can absorb light at the rods of the eye, facilitating monochromatic vision in the dark. In cases of extreme deficiency, permanent blindness (xeropthalmia) occurs. In this case, mucus secreting cells within the conjunctiva of the eye are replaced with keratinised (hardened) epithelium. This results in cornea destruction and total blindness. If you fail to consume yellow/orange fruit or vegetables in your daily ‘2 & 5’, you might find yourself at risk of blindness. That being said, active vitamin A can be directly consumed in non-vegan sources, such as liver. The final two carotenoids that have significant health benefits are lutein (yellow) and zeaxanthin (orange). They absorb potentially oxidative blue light. When insufficient lutein and zeaxanthin is present, blue light has damaging effects on the macula of the eye, promoting its degeneration and eventual blindness. If you enjoy your eyesight and want to avoid macular degeneration (which I’m sure you do), make sure to stock up on orange/yellow vegetables such as sweet corn. Polyphenols are another group of healthful phytochemicals, of which flavonoids are the most abundant group. The most obvious flavonoid is anthocyanin which is red/blue/purple. Think purple carrots, plums and sweet potatoes (yes, you can get purple sweet potatoes!). Polyphenols have been linked to a range of health benefits including cardiovascular health, obesity reduction, anti-carcinogenic properties, decreased oxidative stress and inflammation. Flavonoids pass through the stomach and continue to the small intestine where only a small amount is absorbed. The remainder moves to the large intestine where the real action takes place. Here, flavonoids are metabolised by bacteria within the gut to form phenolic acids which have vasodilation effects at blood vessels. This vasodilation (relaxation of artery muscular walls), lowers blood pressure. Hence, flavonoids are particularly important to mildly hypertensive individuals (those who are very hypertensive will require something stronger than just a little purple food!). Glucosinolates, although not pigmented, are found in green vegetables such as broccoli, cabbage and kale, as well as red radish and white cauliflower. Epidemiological studies show a relationship between decreased risk of developing chronic disease, heart disease and some forms of cancer and diets rich in these vegetables. Glucosinolates are metabolised in the body to produce isothiocyanantes which increase the anti-oxidant response to cancer cells, helping destroy them. Furthermore, some are even capable of inhibiting the bad enzymes that activate cancer promoting mutagens. However, not all glucosinolates are here to help. Some actually have anti-nutritional properties such as pro-goitrin found in kale. Pro-goitrin is converted to goitrin which inhibits thyroid hormone production by blocking iodine uptake. In extreme cases this results in a large protruding swollen thyroid gland on the neck. However, you have to eat A LOT of kale to elicit these effects, so your daily green smoothie is still good to go! While ‘2 & 5’ is a great campaign that has been successful in increasing health, it has a loop hole. By following ‘Eating A Rainbow’ as well as ‘2 & 5’, health is maximised. Since research into these amazing little compounds is only in early stages and many exact mechanisms are still unknown, there are currently no prescribed nutrient reference values. However, trying to ‘Eat A Rainbow’ is a good place to start. I don’t know about you, but anti-cancer, anti-blindness and anti-hypertension are just a few things that get me excited about ‘Eating A Rainbow’. Not to mention, how pretty it will look on the plate!